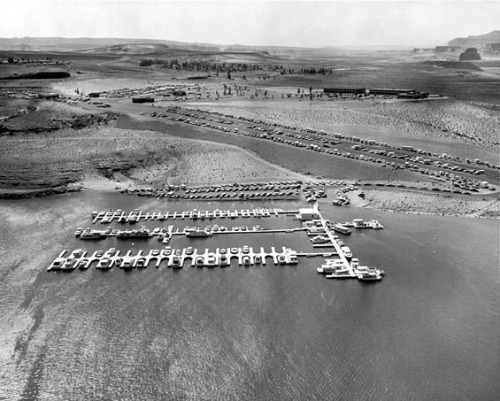 Lake Powell houseboat history really began in 1953 even though Lake Powell did not start filling until after the closing of the right diversion tunnel in Glen Canyon Dam in March of 1963. This was the year, Art Greene, an Arizona pioneer, visionary, and co-owner of Canyon Tours, Inc., became aware that the Federal Government was going to build a dam across the Colorado River at a location just a few miles to the south of Wahweap Creek. Acting upon this knowledge, Green and his family purchased a grazing lease of six school sections of land owned by the state of Arizona. Now that they had a lease with the state of Arizona, they received preferential status when they then applied for and received a commercial lease. With this lease in their hands, they began construction for the cabins, cafe, and airstrip that would be known as Wahweap Trailer Village. 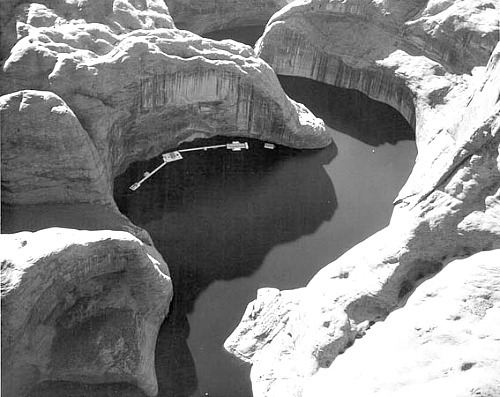 In 1959 the National Park Service formally awarded the Greene's the concession for operating all recreational facilities on the southern part of Lake Powell. By 1963, as the waters of the Colorado River slowly began rising toward its 500-foot goal, Greene had already set about building a temporary boat launching facility at Wahweap. As the lake rose, he gradually moved it until it reached an area where he had constructed a permanent structure which he called Wahweap Marina. That first year, an estimated 44,000 people came to look, to fish, to boat, photograph and explore. As the lake filled and boat traffic increased, Greene expanded his operation, adding the Wahweap Lodge and a marina at Rainbow Bridge. This new marina included a fuel dock, a store, a generating plant and quarters for the National Park Service rangers. From Wahweap Marina, Greene rented boats and led tours to Rainbow Bridge. “Before the summer of 1964, nothing save shoreline and sky existed for 150 miles beyond Wahweap. If you wanted to make it very far from the dock, you had to carry your own gas, and plenty of it. More than a few visitors got stranded or lost. This fact, probably as much as any other, gave rise to the convenience and necessity of using a houseboat on the lake. • It provided them with a way to carry extra fuel for their more economical power boats, which they towed behind the house boat. Once the house boat was established as a base camp, the power boat could then be used for exploring, waterskiing, fishing and sight-seeing. Also, the readily available fuel allowed boaters to follow the rising water ever deeper into canyons which had never before been explored. 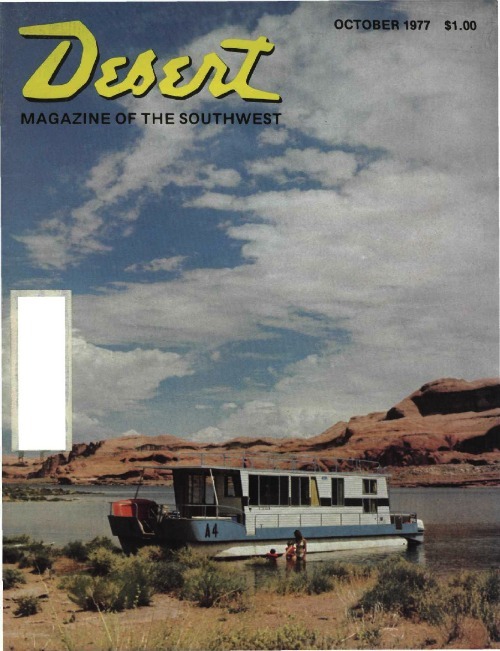 Thus, a new age of discovery had begun with the introduction of the houseboat to Lake Powell. 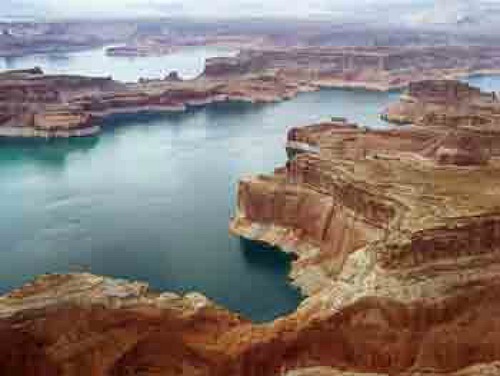 Lake Powell is one of the most beautiful lakes in the United States. It is a magical place, a place that casts her spell over all of us who visit her, drawing us back to her crystal waters year after year. If you would like to share a memorable Lake Powell vacation, please fill out the form below. The Greene family sold their franchise to Del Webb Recreational Properties in 1976 who in turn sold to ARA Leisure Services Inc in 1989. ARA Leisure Services Inc changed their name to ARAMARK in 1994.